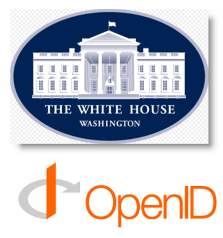 US Government To Embrace OpenID, Courtesy Of Google, Yahoo, PayPal Et Al. During the video interview with OpenID evangelist Chris Messina I recorded earlier this year at a German conference about the state of OpenID, he expressed his wish that the Obama administration would soon start to embrace the decentralized, single sign-on method as a way for citizens to engage with the U.S. government online. Four months later, it looks like his dreams are becoming reality. Later this morning at the Gov 2.0 Summit, Federal Government CIO Vivek Kundra will talk about data.gov and other governmental transparency initiatives, and will also be making an announcement regarding the launch of a open identity initiative featuring the use of both OpenID and InfoCards in a special pilot program. Make no mistake about it: this has the potential to change the way citizens participate in and communicate with the U.S. government. The OpenID Foundation has recently published a letter from executive director Don Thibeau as well as a fairly detailed white paper (PDF) on the subject of open frameworks for open governments that you might want to read for background. While the ‘Participating Providers in the U.S. Government Pilot Program’ section on the OpenID Foundation’s website hasn’t gone live yet, the Information Card Foundation provides more details about the pilot program on its blog. Google, Yahoo, PayPal, AOL, VeriSign, Citi, Equifax, Acxiom, Privo and Wave Systems will be the ten organizations to act as digital identity providers using OpenID and Information Card technologies in the first pilot programs designed for the American public to engage in open government. Representatives from the companies had met with government IT officials early August to engage in talks about the initiative, which ReadWriteWeb caught wind of at the time. The programs are being conducted by the Center for Information Technology (CIT), National Institutes of Health (NIH), U.S. Department of Health and Human Services (HHS), and related agencies. The participating companies are said to be getting certification under non-discriminatory open trust frameworks developed under collaboration between the OpenID Foundation (OIDF) and the Information Card Foundation (ICF) and reviewed by the federal government. In essence, this initiative will help transform government websites from basic “brochureware” into interactive resources, saving individuals time and increasing their direct involvement in governmental decision making. OpenID and Information Card technologies make such interactive access simple and safe. For example, in the coming months the NIH intends to use OpenID and Information Cards to support a number of services including customized library searches, access to training resources, registration for conferences, and use of medical research wikis, all with strong privacy protections. Likely, we’ll learn more from Vivek Kundra’s scheduled speech at the Gov 2.0 Summit later today, but one thing is crystal clear: this is a big win for both the OpenID Foundation and the Information Card Foundation. Who would have predicted say, 5 years ago, that you would some day be able to use commercial identities on government websites? Evidently, this raises questions about privacy and security but if these initiatives can garner enough public support, government validation of open identity frameworks could be a boon for the ecosystem of the open, distributed web. Plus, it can make dealing with the government a lot easier for you, too. P.S. : also read Tim O’Reilly’s guest post on Gov 2.0 as a platform.